I have been using a Farish hand controller and a H&M Clipper for many years but sadly the Farish has finally died. I am looking for a twin (or two single) controllers to replace the ones I have. I use Kato Unitrack on my main layout with smaller scenic layouts using Peco. I have narrowed my search down to either a Gaugemaster Model D or two Kato 22-018s. Does anyone have any advice or opinions on these options? An additional question: I have read that old H&M controllers can damage more modern motors. Is this true? Re: Controllers - the agony of choice! Maybe if used in half-wave mode as that's a low frequency pulsed power. 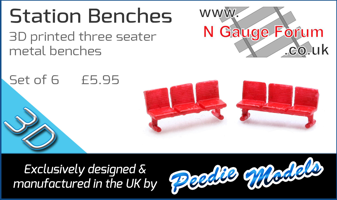 Keep the H&M set to full wave and high resistance as the best settings for N gauge, but even so you have to remember those old controllers were designed for OO and large gauge models made in the 60s and 70s. Something more modern will be better. I still have the cases for my H&Ms, but the internal resistance mats were replaced by Gaugemaster 100 panel mount controllers years ago. In this guise they make useful backups in case I have a problem with my KPC controllers. Hi Lightning and welcome to the forum. When my layout is switched for DC running, I use the Kato controller. I also use a Kato controller on the test layout. I like the way power is controlled by the handle thingy! Having said that, I like all things Kato - controllers/track/running stock. . Of course, there are many different opinions as to which is best, so somebody will be along with a different take on the question. If possible, see if you can try a few different ones out in a shop or at a show. On HOLLERTON JUNCTION I use a controller from Morley. It is the Vesta N Zero Two model and. Ones with two free additional hand held contollers that Plus in to the main unit. The controller works well all N gauge locomotives. I have a Gaugemaster Model D and it performed happily for years when I used DC. After I moved to the US and I still used it through a 120/240 step up transformer. Now I've gone DCC so it sits in a box most of the time. I have the Morley Vortrack (4 track) for my main layout and that has 2 x 5m cable length hand helds (I've added a 3rd) along with a built in CDU. For the smaller layout I have a Gaugemaster cased twin track with simulators, although I find the latter just a gimmick of not much use. Morley carry a 5 year warranty whereas Gaugemaster have a lifetime warranty. I also have a Farish controller I use to power my Kato testing oval. I've had both the Morley and various Gaugemaster controllers, but now I'm using the bluetooth controllers by BlueRailways. They're brilliant, either as wired controllers, or using the bluetooth system as a hands free remote controller. Forget using a phone/tablet though - it's fun for a few minutes, but not really practical. Very helpful guy who runs it all. I have narrowed my search down to either a Gaugemaster Model D or two Kato 22-018s. I use two fairly new (about 6 years old) Kato 22-014 controllers on my US layout. One failed and I replaced it. Like @dannyboy I like the Kato control handle! His advice about trying both types before a purchase is very good. But, if you want me to dismount from this comfortable fence... if I was asked to advise someone starting out in the hobby; I think I'd plump for the Gaugemaster. Having read them and a lot of reviews and forums I have decided to go with the Gaugemaster Model D. I am looking forward to being fully functional again! Judging by a lot of the comments on the forum, not may of us are "fully functional", although our layouts are okay! . DCC would mean all new control stuff and decoders for every locomotive which would be an investment I am not willing to make. Besides which I understand DC and have used it for almost fifty years. DCC would mean learning a whole new skill set. I am happy with DC and will continue to use it. Everyone is different (thankfully) but it's DC for me every time (I love wiring though) and Gaugemaster Q with separate transformers. For me everytime it is Modelex. I have used them on Moorcock Junction and Armathwaite and simply will not use anything else due to reliability and superb back up and advice. And yes I am another DC only chap....glad I am. At a recent show the noise of locos from various layouts was beyond a joke!! No connection to Modelex, just a very satisfied customer. Great to have you back posting again Bob ! Page created in 0.198 seconds with 47 queries.